Take one of the HST-ish things we got when we sewed two triangles of background fabric together back in step one, and sew it to a Unit #6. We’ll call this one Unit #8 and we need two of them. Now take two Unit #7’s and sew them onto a Unit #6 as you see below. We’ll need two of these and we’ll call them Unit #9. 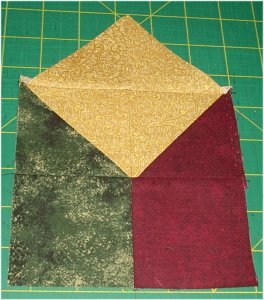 Take Unit #4 and sew it in the center of two Unit #6s as shown below. We’ll call this one Unit #10. Aren’t you glad you’re using Post-it notes to keep these all straight?